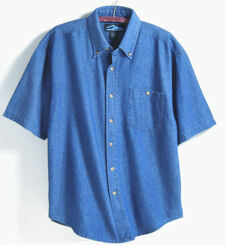 SHORT SLEEVE - 7 ounce 100% Cotton denim stone washed shirt. 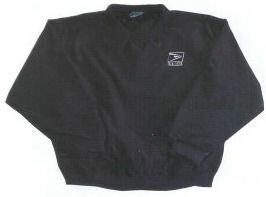 Left chest pocket with button. Yoke back. Light Indigo. 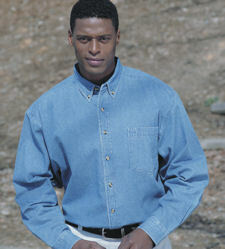 LONG SLEEVE - 8 ounce heavy-weight cotton denim stone washed shirt. Left chest pocket. Button down collar. Double pleated back. All seams are double-needle stitched. Totally a classic. Light Indigo. 50% Cotton and 50% Polyester, 9.3 ounce. 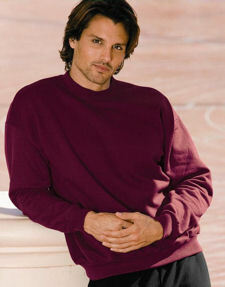 Fleece fabric, cover seamed neck, armholes and knit cuffs. Sizes: Small to 3XL. This shirt is constructed of wind-proof water resistant, all seasons polyester microfiber and is fully lined with lightweight nylon. Also features two side seamed pockets, ribbed crossover collar, cuffs and waistband.